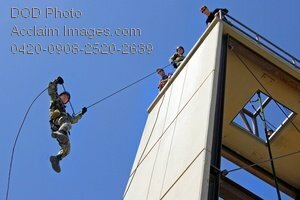 Description: Free, public domain image: Soldier Rappeling Down a Tower. CORONADO (March 23, 2009) Naval Special Warfare SEAL Qualification Training (SQT) candidates learn how to rappel from a 60-foot tower at Naval Special Warfare Center. SEAL Qualification Training is a six-month training course that all SEAL candidates must complete before being assigned to a SEAL team. (U.S. Navy photo by Mass Communication Specialist 2nd Class Arcenio Gonzalez Jr.